In college, I had a 100% Italian-American boyfriend, and I was partially adopted by his very traditional family. His mom was about 4’10” and a spitfire, and every week, she had a cooking schedule. A certain day of the week meant soup, another day was always a roast, and Sunday was spaghetti and meatballs. She’d make the sauce on Saturday afternoon so it could simmer until after mass on Sunday, and Saturday night, she’d fry up her meatballs and put them on the back porch to cool until they were dropped into the sauce on Sunday morning. In addition to quality tomatoes, lots of garlic, and extra-virgin olive oil, a respectable “Sunday Gravy” also usually includes a healthy dose of red wine (both in the sauce and in the cook). But you and I, we’re not just any Italian (food) lovers; we are dino-chow afficianados. So we say rifiuto! to pasta and bread and wine and EVOO cooked at high temperatures — and then we say benvenuto! to vegetable noodles, balsamic vinegar, and ghee. 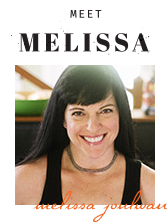 This recipe is from my cookbook Well Fed 2: More Paleo Recipes For People Who Love To Eat. And although this recipe is a tiny bit of a project, it rewards you with enough tender, succulent meat to last for several meals—and it can be frozen, too, so you can defrost Italian love anytime you need a food hug. The balsamic vinegar gives the slow-simmered sauce just the right zing, and pork chops, Italian sausage, and beef meatballs infuse the sauce with flavor while, in turn, taking on the tang of tomato and garlic. Brown the meats. Heat coconut oil in a large, deep pot. Sprinkle the pork chops with salt and pepper, then brown them on both sides, about 10 minutes. Remove the chops from the pot and place in a bowl to catch the juices. Brown the whole sausage links in the same pot, about 10 minutes, and place in the bowl with the pork chops. Make the sauce. You’re going to make the sauce in the same pot, so add a little coconut oil if there’s no fat left in the pan. Cook the onions with the oregano until they’re very soft, about 7-10 minutes. Add the tomato paste and cocoa. Sauté until beginning to brown, about 3 minutes. Add the garlic and cook until fragrant, about 30 seconds. Prep the meatballs. Preheat the oven to 400F and cover a large baking sheet with parchment paper or foil. In a small bowl, mix the water, baking soda and cream of tartar with a fork until combined. 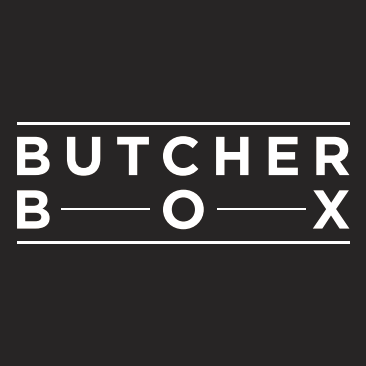 Crumble the beef and pork into a large bowl, then add the garlic, tomato paste, vinegar, parsley, salt, Italian herb blend, red pepper flakes, and water/baking soda. Mix well with your hands (or if you want it very smooth, with a food processor or mixer) until combined. Cook the meatballs. Measure 1 tablespoon of the meat and roll into a ball. Line up the meatballs on the baking sheet, then bake 20 minutes, until browned. The final steps. When the sauce has reached its 2-hour simmer deadline, add the meatballs to the sauce and simmer an additional 15 minutes, uncovered. Remove the sauce from the heat and toss in the fresh basil, then taste and add salt and pepper, if necessary. If you used bone-in pork chops, the meat could fall right off the bones; you might need to liberate them from the sauce (lest you choke a dining companion). Ladle the sauce over a pile of Zucchini Noodles or Roasted Spaghetti Squash and top with a little of each kind of meat. Mange! If you like your sauce smooth, you can purée it in a blender or food processor before adding the meatballs. I really like it that way, but some people prefer the most rustic, chunkier sauce. I like to eat this like a stew and skip the “noodles” underneath. I just pile a piece of each kind of meat in a deep bowl and top with sauce. 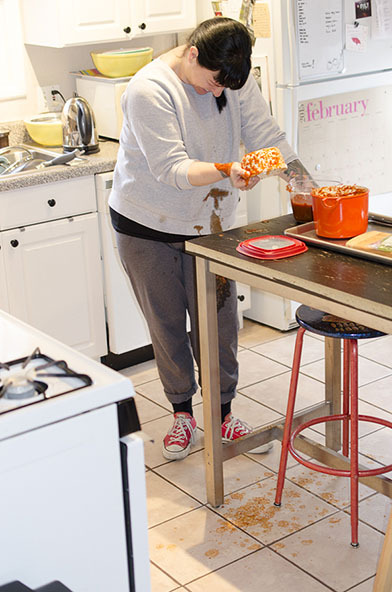 In case you missed it, be sure to check out this photo of the kitchen disaster that ensued when tomato sauce met gravity (and yoga pants and the tile floor and…). This will absolutely be on my cooking schedule for the week. Looks wicked, which in my opinion is the best kind of look! I bought Well Fed 2 awhile back and was intending to make this and never got around to it… until yesterday. Of course it was the bomb! I fed a group of 12 and everyone raved on it. I did increase the recipe by about a third so the only pot I had big enough was my new 8 Quart Instant Pot, so I did it on the low, slow cook setting. I know it’s not a slow cook recipe but, oh so good! Thanks for the recipe! Hooray! I’m glad you gave it a try! That’s the recipe I make when I want lots of leftovers because it’s so easy to make a double. Good to know it works well in the Instant Pot! Hey Mel. I waited a LOOOOOONG time to make this. Timing in life is everything. I made the sauce first with the sausage and the pork chops. I worked on it while Prince Harry and Megan Markle married. Then I completed this the next day–well today actually. This is the right size for splitting in half and freezing. Thanks again for another great recipe. And…I decided I didn’t want veggies, so I put the meats in the bowl and topped with the sauce! I’m really glad you tried this one—it’s so comforting. You’re going to be really happy when you defrost that second batch is dinner is ready in a snap. And now you’ll always think of that gorgeous wedding when you make this recipe. FUN! This looks amazing! One question though, in the directions for the meatballs it says to “crumble the beef and pork”, but there’s no pork listed in the ingredients. is it optional to use half beef and pork, or is something missing? Good catch! My original recipe was half beef, half pork, but I like the all-beef version more. Error has been corrected above. Thanks. I’m going to make this tonight-can’t wait! Going along with Pam’s comment, there’s no instructions for what to do with the pork chops in the sauce. Surely they need to be shredded at some point? I hope the final version will include an explanation of the reason for the baking powder, which took me by surprise. The pork chops remain whole, as does the sausage… but you can certainly shred the pork if you like. My first batch, I did it that way, and I didn’t like it as much. The pork chops get very tender and may fall into large-ish pieces, but I preferred them that way to shredded. It got too much like pulled pork, in my opinion, when I shredded them. Baking powder! Because I don’t use any fillers/binders in my paleo meatballs (like almond flour, for example), I discovered that using a little baking powder makes the meatballs more tender and a little airier. It’s a good trick! I’m intrigued by the baking powder… can’t wait to try it! Not to be the paleo police, but baking powder has cornstarch in it. Baking soda plus cream of tarter should do the trick. I would ever have thought to do this though! Good catch! I forgot I need to switch that out for baking soda plus an acid. Recipe has been updated — thanks for the reminder! Your recipe calls for baking SODA and I mistakenly asked you about baking POWDER. In any case, I’d never have guessed it would help the meatballs out. Great tip! Thanks. No, it originally said baking powder, then I corrected it because it should be baking SODA. The recipe above is all-good now. I tested it just a few minute ago, and it’s 4-star! I’m looking forward to making this batch of meaty, tomato-y goodness! 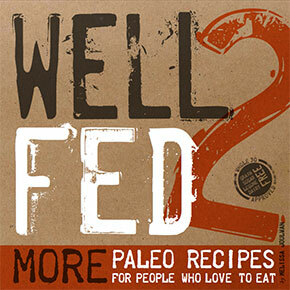 And looking forward with greater anticipation the release of Well Fed 2…I can’t wait!! Thanks. Looks relish and was so worth the 24 hour wait!-I am going to do my weekly shopping now. My mom is 100% Italian too and her meat sauce is filled with all that Italian “goodness”. I don’t partake in it too often anymore but my kids love it. Can’t wait to make them this healthy paleoized version. Thank You! Love the baking powder idea too. Mmmmmm. This is gonna be the big meal with my next paycheck. Oh holy yum, I have so been craving Italian lately. This shall do the trick for our weekend feast! Totally excited to see what Well Fed 2 has in store, thank you for the sneak peak! Update: I made this, ate it for four meals straight, and fought the husband for the last leftover cup. No joke, it was fan-freakin-tabulous. Oh… yay! You’re so nice. I’m glad you liked it! I thought it was tasty, too, but it’s always great to get outside corroboration. 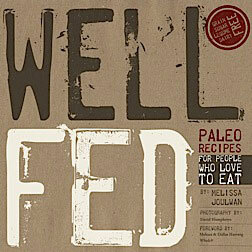 I’m excited/nervous about all the new recipes in Well Fed 2. This looks like a good Sunday cook-all-day dish! I’m a bad pork chop cooker – they’re not my best meat. They always seem to end up really tough and over cooked. My chops seem to equal that of a 10 lb weight plate, even when cooked in some kind of sauce. Any tricks to make sure they don’t overcook? Bone-in chops will stay more tender during the somewhat lengthy cooking — and if you get some with a little fat instead of super-lean, that will help. Looks awesome! How many meatballs do you get? One pound makes about 10-12 meatballs if you use a 1-tablespoon measure to form them. Drooling over here! Looks phenomenal! 2. This looks awesome and I was getting excited to make it as I was reading – will happen this weekend! 3. Looking so forward to Well Fed 2! 4. I have always thoughts I like my sauce rustic/chunky, but then I realized I never make it smooth. Think I’ll give it a try, or at least some of it to compare. Oo, sounds so tasty! A quick question, when you say 2 cans (28oz) tomatoes, do you mean 2 28oz cans, or 2 cans equaling 28oz? That’s 2 X 28 ounce cans — it’s a BIG pot of sauce, and it is awesome. Looks yumtastic! Is the Italian Sausage ground, or links cut into slices? I used whole links, and I didn’t cut them. They get VERY tender when simmering, so I recommend leaving them whole. They might break into chunks during/after cooking, which is nice for serving. if you want, you can cut them in half before cooking, but I wouldn’t do coins, or they might mush into oblivion. I am dumb! Or… to be fair… I committed the paleo sin of forgetting to read a label. As a helpful reader above pointed out, baking POWDER contains corn starch. I’ve updated the recipe above to use baking SODA instead — which doesn’t contain any non-paleo ingredients. Interesting to note: baking SODA needs an acid to be effective, so cream of tartar does the trick. Sorry I missed this first time around, but the recipe is updated and paleo-approved now. Enjoy! Italian sausage is a bit hard to get in my neck of the woods. Could I just use pork sausages? Not actually sure what an italian sausage is. Italian Sausage is labelled as such and includes Italian herb and spices. If you can’t find that, any turkey or pork sausage will do as long as it’s not smoked and isn’t, like, German bratwurst or something. A basic, fresh (not smoked) pork sausage should work great. I really want to start making fresh sauce in large batches like this and freezing remainders, but am stumped at to the right kind of containers to freeze it in. What do you use to freeze your sauces and/or other leftovers? They’re Rubbermade, BPA free, and don’t leak, even when I knock them out of the fridge and onto the floor. You must get the PREMIER line for them to be BPA free. Also, Glad has started making its disposable container BPA free, too. (See FAQ http://www.glad.com/faq) These are also pretty darn good and can be purchased at the grocery store. Made this yesterday…I must say this is now my new favorite of all your recipes (and that’s saying A LOT cause I love all of them). The smell of all that meat cooking and the fragance of the tomato sauce–heavenly!!! My son and hubs loved it too and have declared it the new birthday dinner recipe. Oh yeah! AWESOME! Thanks for letting me know! So far, Dave and I (plus two friends who came for a tasting dinner) are the only ones who’ve eaten this recipe. Such a relief to know you enjoyed it. YAY! And btw, I followed the recipe to a “T”…no changes or subs. My hubby thinks I’m genius. I credited you all the way. It truly is delicious. I will not wait for birthday’s to make again, that’s for sure. ACK! I went out and bought baking powder before the paleo police called you out. How much baking powder did the recipe call for before you changed it? I love this recipe and will like to try it. Can i use the sauce for a lasagna? Ive been looking for a meat sauce recipe. The meat in this recipe remains in big chunks, so it won’t work as-is for lasagna. If you wanted to use this for lasagna, I’d recommend removing all the meat from teh sauce when it’s cooked… puree the sauce, shred the pork chops, slice the meatballs, slice the sausage… then when you make your lasagna, layer the noodles, then sliced meats, then pureed sauce… repeat, repeat, repeat. This recipe sounds great! I think I’m going to make it on Sunday. Spag (with veggie noodles or spaq squash these days) with meatballs is one of my favourite meals! My hubby loves pork chops, but I don’t like cooking them for some reason. Throwing everything in the pot sounds like a win-win for everyone! That’s a pot I borrowed from my neighbor Stef for photo purposes — I think it might be an old Le Crueset? I’ll see if I can find out for you. I’m making this tonight and can’t wait! I bought ground italian sausage didn’t realize they were supposed to be links until I read the reviews. Should I go grab links or do u think the ground will work? The loose sausage will work just fine. Just follow the browning instructions and you’ll be good to go. This came out incredible! We love it. This will officially be our family sauce recipe moving forward. Thanks so much for the recipe!! Oh, awesome! So glad you liked it! my mom used to use short ribs in the sauce a big fav of mine..The meat would just fall off the bone.I like you would just eat a big bowl of the sauce w/ the meat.Who needs pasta.. I get excited about any recipe that has “old school” in the title! Sigh. This is seriously hands down the BEST sauce I have ever made or eaten. This is my new go-to recipe. I had non-paleo friends over for dinner and they were licking their plates too. SOOO good! AWESOME! Thanks for letting me know it’s a keeper! What can we substitute for pork chops since we don’t eat pork? Thanks. You can just skip the pork chops… but if you want to add more meat, you might try some bone-in, skinless chicken thighs — or could make a double batch of meatballs. Love that you used this as a base for your own experimentation — that’s awesome! Hope you enjoyed the end result. Thank you for the sweet words about Well Fed and the enthusiasm for Well Fed 2! We’re wrapping up a big chunk of production this week… very exciting! Oh, Columbus Bakery!! I grew up in Syracuse & it was a weekly tradition for our Italian family to have Columbus Bakery bread with our Sunday Sauce!! My grandmother is 100% Italian & makes her sauce very similar albeit not paleo. Can’t wait to try this! “Four forks up” here at our house! Actually more like spoons – I ate this like a stew. My two sons and my hubby each asked for second helpings! Today was a hot day so I made it in the crockpot (browned the meatballs briefly on the stovetop before putting them in the sauce to finish cooking). It’s a keeper! OMG! I love trying to find new ways to do this. I’m half Italian so a JAR of sauce is an UTTER Italian SIN! I’m eager to try this especially your compliant MBs!! I have such a thing for MBs. I don’t know why. I HAVE recently discovered through a family event other’s ways of making Italian sauce and they did throw in all different kinds of meats! It was SOOOOOO much better that way!! Ohhhhh now I want to go home and make this too!!!! grew up in Syracuse & Columbus bread is the best!!!! hard to explain to people not from there how bread really is different….every time we go back I need a full month of food detox! I’ve literally eaten bread all over the world, and nobody beats Columbus bakery. I made this tonight for dinner and served it over roasted spaghetti squash. I’ve never really liked pork chops before, but this was INCREDIBLE. All of the meats were very tender and the sauce itself had so much flavor and depth. My boyfriend couldn’t even speak it was so delicious. 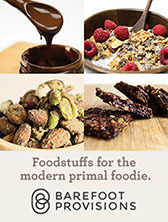 I’m new to the paleo world, but if I can eat like this, I’m in for life! That’s awesome — I’m really glad you liked it! 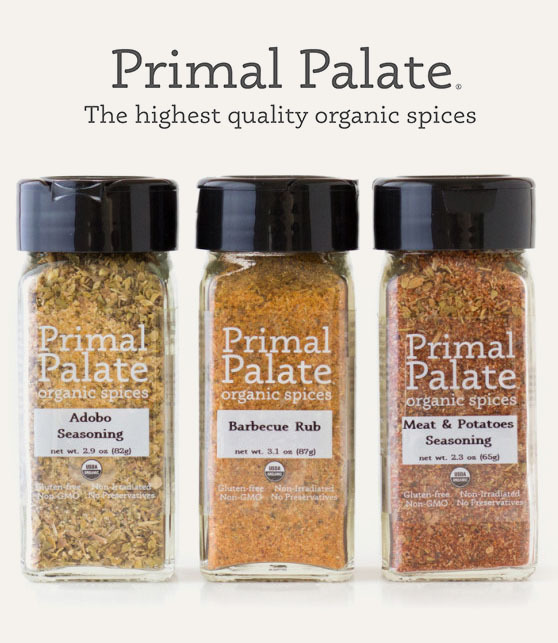 And yes, you can eat this kind of yummy paleo food forever. YAY! This recipe looks amazing! Have you ever tried cooking the meatballs completely in the sauce? Do you think they would fall apart too much? Can’t wait to try this! BTW, I have both your books and your recipes are really AWESOME! You have a serious talent in the kitchen! I haven’t tried it, but I suspect they might fall apart. But if you don’t mind having meat sauce, try it and see what happens! So glad you’re enjoying the cookbooks! I love that you use pork in the sauce. That’s how my little Italian mom does it, too. She uses pork ribs though. It really gives the sauce a great flavor. Can’t wait to try this recipe! MOST excellent – you know what’s also really great in this sauce? short ribs. YESSSSS. If you wanted to cook the meatballs in the sauce, I suggest browning them in a skillet to give them a crust, then cooking in the sauce. That’s the way we do it in our family Italian sauce recipe, and that’s the way I did it using your meatball recipe in our sauce recipe. Worked beautifully. Dumb question, but what do you do with the pork chops when it’s done? Just serve two people pork chops instead of meatballs? My southern aunt married an Italian from Rhode Island. She came to our house and made spaghetti sauce with meatballs and pork chops. I had never even had spaghetti before. I remember it as being one of the best things I had ever tasted. I asked her about it recently and she couldn’t remember it. So pleased to find that this is actually an authentic Italian dish. Can’t wait to try it. Hope you enjoy this recipe — glad it brought back fond memories for you. I love that food can be so closely associated with family. Enjoy! Thank you for this fabulous recipe. i’ve been making a pretty yummy (but simple) meat sauce for years, but thought i’d like to join the ranks of the nonna’s out there and try my hand at a true “gravy”. The results were truly inspiring! One question though… My meatballs were not remotely tender. Perhaps they were too small and cooked too much in the oven? I used the baking powder/water rather than soda/tartar/water mix (didn’t have cream of tartar on hand). I also wondered whether they wouldn’t have been just as happy doing all their cooking in the sauce, rather than the oven first. Hmmm… I haven’t heard that complaint from anyone else so maybe your baking powder is old (? )… also, baking powder isn’t paleo, if you care about that. That’s why I recommend soda/cream of tartar. Yes, you can cook them directly in the sauce instead of baking. I like them baked because they get brown and more flavorful, but if that’s not your thing, plop them in the sauce about 45-60 minutes before its done simmering. I also had less-than-tender meatballs even with soda/tartar. However I believe the baking time was a tad long for the size of the meatballs (especially in my oven that tends to run hot). I made a note in the cookbook to bake them only 10 minutes next time. The flavor was on point though…and the whole recipe is just awesome! OMG Columbus has the BEST bread, especially the flat bread! So exciting to see you mention a bakery from my hometown. That being said, I cannot wait for next weekend to make this sauce and the meatballs sound amazing!!! Thanks for sharing!! Making it again tonight – first time was such a hit. great recipe! WoW! Made this for the first time today. Amazing taste. Just…wow! Thank you for this recipe. It will be a regular for us in winter. Day 5 of Paleo and I’ve been itching to make this since we made the decision to jump in. Goodness gracious! This is some good stuff. The table fell silent as we ate. 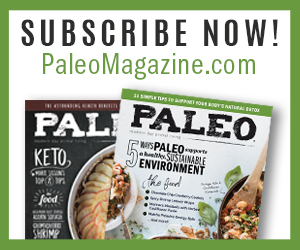 Congratulations on taking on paleo — glad this was a hit! Happy new year! Hey Mel! I Just Started The Whole 30, And I’m Very Interested In This Recipe. Would You Replace The Cream Of Tarter On This Recipe To Make It “Compliant”? This recipe is 100% Whole30 approved exactly as written above — no need to sub out the cream of tartar. Cream of tartar isn’t cream at all — it’s technical name is potassium hydrogen tartrate and it’s acid/salt. On my first Whole30 and live in a house full of boys who are used to eating Red Beans & Rice and homestyle Mac & Cheese with every meal. Needless to say they are less than thrilled with my Whole30-ing, but I made this for them these weekend and they LOVED it. All is well in the world. 🙂 Thank you so much for sharing this!! Congratulations on tackling the Whole30. Glad this recipe was a hit with your picky eaters! Made this last night and it was so so yummy! My husband was in heaven and finally went back for seconds on a recipe I made while doing the Whole 30. Thank you!!!!! Hooray! Thanks for letting me know you both liked it. And happy Whole30-ing! Made this and both my husband and I loved it. He kept repeating the flavors!, the flavors!, the whole time he was eating it. We ate it over a bed of spaghetti squash. My husband normally objects to paleo substitutes, like squash for pasta, on principle, but the sauce was so good, he didn’t complain. The only change I would like to make is to include wine. I am not a purist and will drink wine with the sauce anyway. I was thinking of replacing the beef broth with the wine. Also my husband wants to include roasted garlic, but I don’t know if a straight substitution would work since the flavors aren’t the same at all. I think I am just going to add the roasted garlic whole to the sauce and still include the chopped fresh garlic. What do you think. Hooray! I’m glad it was a hit! You can certainly use wine — replace the balsamic vinegar with good red wine. So I should use bone in pork chops? You can use either boneless or bone-in. Both get very tender and delicious during the simmering stage. This was LITERALLY the best sauce I have ever made! Day 7 of Whole 30 and I am feeling good! Thanks for all your WONDERFUL recipes! Congratulations on Whole30-ing! I’m so glad you liked this recipe. YAY! Just wondering, what kind & how much beef is in the all beef version? I’m not sure what you mean by “all beef version”? This was our awesome dinner tonight!!! I’ve been fawning over this recipe for awhile, along with so many other recipes in my copy of Well Fed 2. We’ve tried all the meatballs, plus I used your pattern to invent a few of my own, & various other recipes, but tonight we finally got around to this one. The only change I made was the meatballs were all beef. I figured there was already plenty of pork in there. Shortly before serving, I removed the pork chops, deboned them, & cut them into bitesize pieces, then I also cut the italian sausages into 4ths, and put both back in. Served on top of a bed of sautéed zucchini, red onion, garlic, & carrots. I picked up a bottle of wine, a loaf of Columbus and away we go! The onions and oregano are cooking down, thanks for this! just wondering about the coconut oil. Does it have a coconut taste? Has anyone used the coconut oil? How does it taste? Did anyone substitute it with regular olive oil? I don’t think it tastes like coconut, but if you’re worried, you could use clarified butter or lard instead. I don’t recommend olive oil for cooking at high temperatures because it oxidizes, which is not good. What can I do if I do not have fresh basil? You can either omit it or use a little dried basil. Cannot wait to make this. I live in Syracuse and it’s so cool to see you mention things from around here. Columbus Bakery is the best and you have no idea how much I miss their flat bread!! If I close my eyes, I can still conjure of the smell outside Columbus Bakery. So good. And Celebrity Den restaurant?! OMG. I have a question. The recipe in Well Fed is much different than this one (use of cocoa etc) which one is the most updated? Thanks can’t wait to try it. I’ve loved everything I’ve made from Well Fed so far! 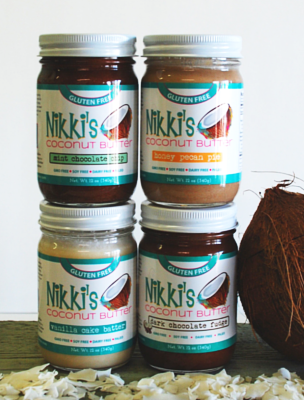 I can’t wait to try the meatballs and sauce but will swap the coconut oil for grassfed Fatworks lard! You can always use whatever is your favorite fat in my recipes — just swap 1:1. Made this weekend and everyone raved about it. This is excellent and a keeper of a recipe. Thank you for sharing it! Glad it was a hit! Thanks for letting me know you liked it! I have a question. 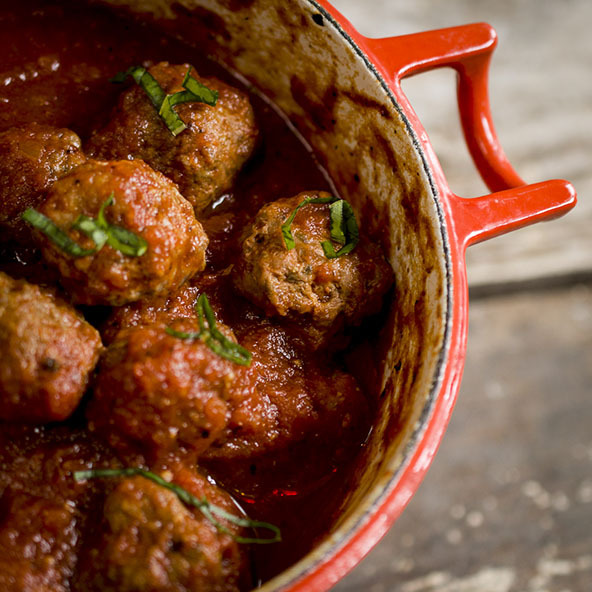 What’s the role of the balsamic vinegar in the sauce and in the meatballs? Is it crucial for the final taste? Can I substitute the lemon juice for it or skip it? The balsamic vinegar is taking the place of red wine in a traditional sauce. If you don’t have balsamic, just skip it. It will still taste great. Do you think this recipe would work in a slow cooker? Love your recipes!! I’m sure it can be adapted, but slow cooker recipes are not my specialty, and I’ve never tried this in the slow cooker. You’ll definitely want to brown the meats before putting them in the slow cooker and here’s a blog post with tips on how to adapt recipes for the slow cooker. http://www.foodnetwork.com/how-to/articles/six-tips-for-adapting-a-recipe-for-a-slow-cooker.html Let me know if you try it! I live in India and can’t find pork chops or whole 30 compliant sausage where I live. Can I substitute them for spare ribs and homemade lamb sausage? Yes, you can absolutely use spare ribs. The lamb sausage will work if the seasonings are right. Do you know what spices are in the lamb? You want to make sure they don’t clash with the tomatoes and Italian herbs of the sauce. You could substitute additional meatballs or ribs instead.